Organic Gemini’s Founders Live on Tiger Nuts. They Hope You Will Too. 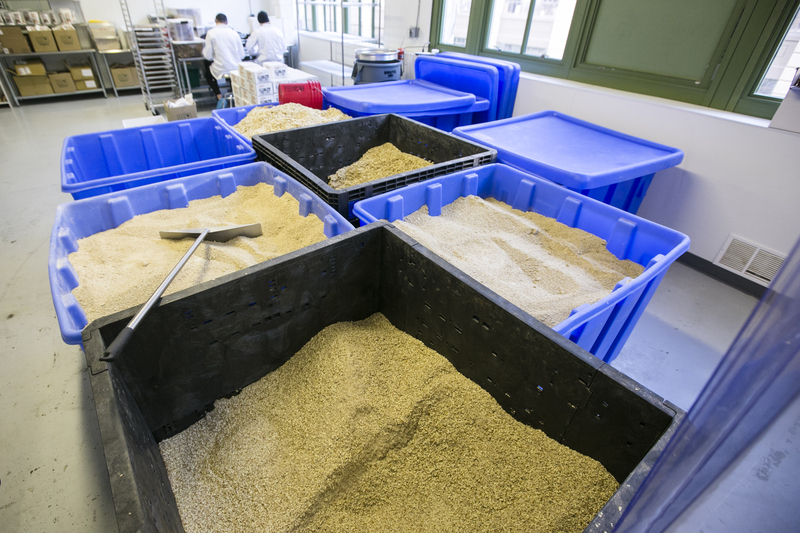 In just three short years, Organic Gemini has taken its tiger nut products from conception, to the first stage of manufacture, to growth and a brand new 15,000 square foot, state-of-the-art manufacturing facility in Sunset Park, Brooklyn. Tiger nuts are the fingertip-sized root vegetable that grows at the base of a grass known as Cyperus esculentus. Although the grass is deemed by the USDA a noxious weed in four states, the grasses are cultivated in Spain, Africa, parts of Latin America, and the Middle East for their highly nutritious tubers. Organic Gemini gets their tiger nuts from Niger. The amazing superfood has a similar fatty acid content as olive oil (75 percent oleic, and 10 percent linoleic acid), is more nutritious than beef in 10 out of 18 core micronutrients, and has a carbohydrate, fat, and protein ratio almost identical to human breast milk, according to research published in Comprehensive Reviews in Food Science and Food Safety, and on the well-researched blog, Free The Animal, by Richard Nokoley. 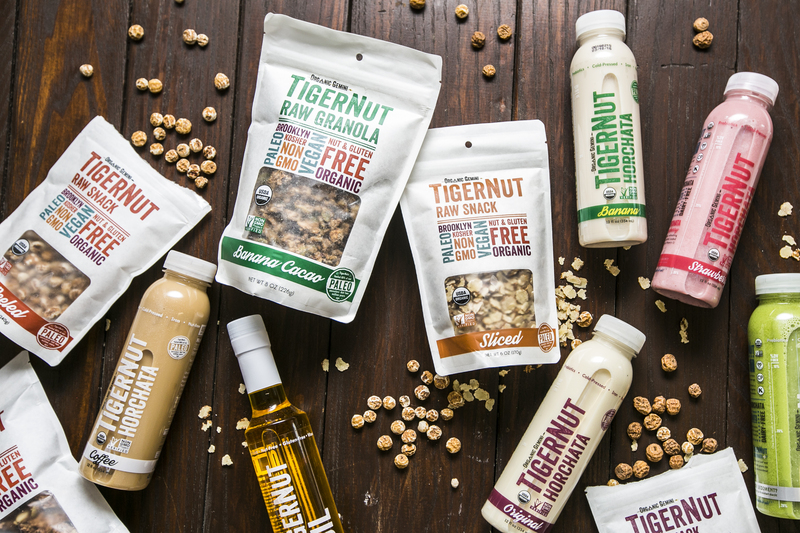 George Papanastasatos, Organic Gemini’s 31-year-old co-founder, COO, and president, said in an interview that tiger nuts are a platform for the company, and that all they do is process the tiger nuts. “It is Mother Nature. She provides it, and we put it in the bag,” he said. 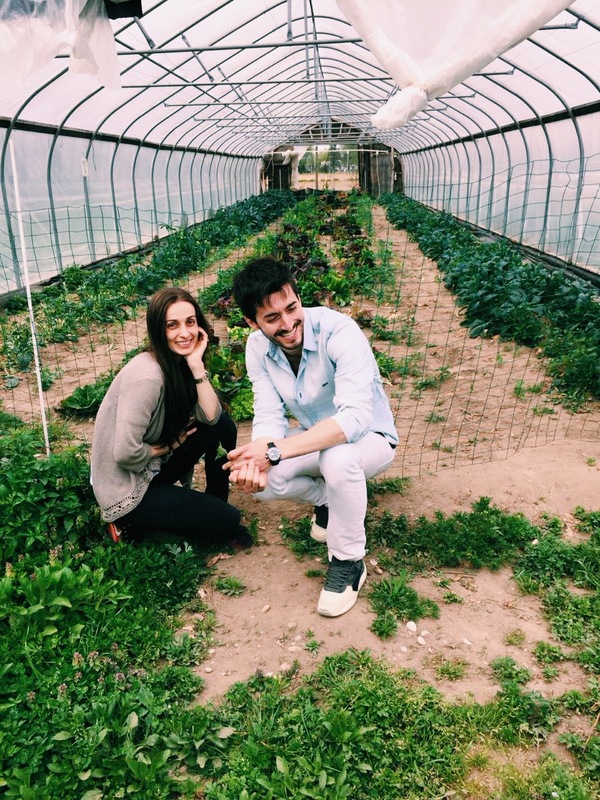 Papanastasatos runs Organic Gemini with his fiancee, 30-year-old co-founder Mariam Kinkladze. 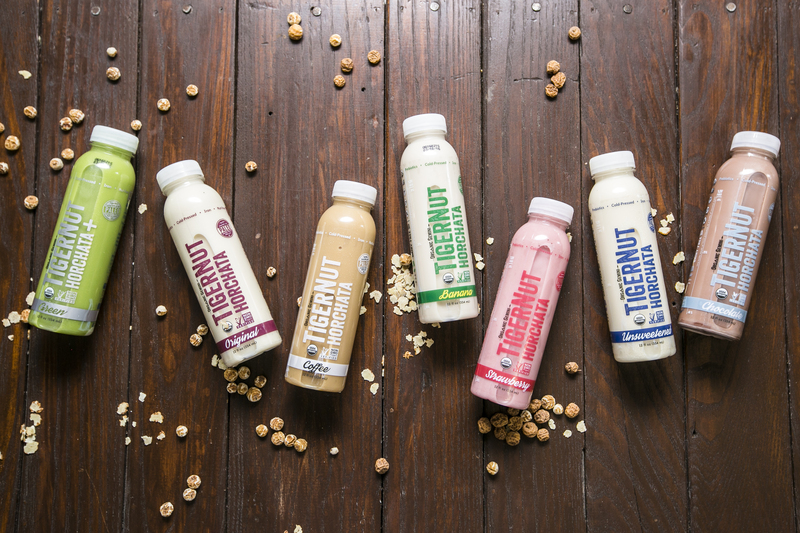 Organic Gemini makes TigerNut Horchata drinks, TigerNut Granola, TigerNut Flour, TigerNut Oil, and whole, peeled, or sliced TigerNut Snacks. It just launched a partnership with Whole Foods for an exclusive Smoothie Mix booster in three flavors. As long as its gluten-free, nut-free, dairy-free, allergen-free, and kosher, Organic Gemini will consider it—as long as it features tiger nuts. The vegetable is novel in America, but it is famous in Spain for the sweet, milky drink made out of it called horchata, and for the horchateria cafes where the drink is frequently served with fried churros. Despite its popularity in Spain and many other Hispanic countries, tiger nut horchata was not previously available in the United States. Papanastasatos said Organic Gemini has introduced Americans to the original horchata recipe, made with tiger nuts, and sweetened with only dates and other fruit. In the United States, where tiger nuts are difficult to source, Hispanic immigrants who own restaurants have adapted the recipe. They make a sugary type of horchata using rice or almond milk, frequently with cinnamon added, said Papanastasatos. Many Americans will be familiar with this version. Sold in 1,000 Whole Foods stores across America, Organic Gemini is the most visible company selling tiger nuts here, and the only company that is certified organic. The only other option for tiger nuts is Tiger Nut USA, which sells online only, and has a smaller product lineup. 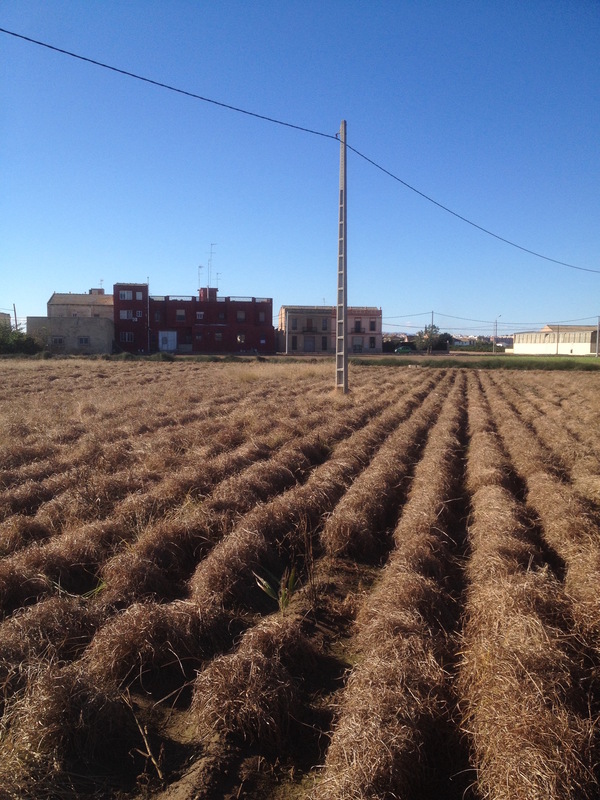 Last year Organic Gemini bought 175 tonnes of tiger nuts, Papanastasatos said. This year it has secured for purchase 650 tonnes of the root vegetable, with anticipated sales growth of well over 300 percent. Cyperus esculentus, which grows in clumps up to a height of 3-6 feet, is in the same family of grasses (sedge) as the papyrus, which was used by the Egyptians for scrolls. Incidentally, it was the ancient Egyptians, as far back as 6,000 years ago, who are believed to have first cultivated the plant, researchers Daniel Zohary, Maria Hopf, and Ehud Weiss wrote in their book, “Domestication of Plants in the Old World,” cited in a Wikipedia entry. If that weren’t enough, tiger nuts’ ancient cred goes back even further, to Nutcracker Man, an early human, who lived between 2.4 million and 1.4 million years ago. A recent Oxford University study associated the big fat molar teeth and powerful jaw on recovered skulls to be consistent with a diet of up to 80 percent tiger nuts. “We developed a sweet tooth because our ancestors ate this little root. We feel there is something there we still haven’t discovered,” said Papanastasatos. In the United States, tiger nuts have a cult following from members of the paleo diet community who like it both for its paleo roots, and for its incredible nutritional qualities. Most notable nutritionally is the tiger nut’s resistant starch, which is a type of prebiotic fiber that is broken down slowly in the large intestine by the trillions of beneficial microbes that live in our bodies. Resistant starch is rare to get in a raw, whole food form in the modern diet, according to resistant starch and paleo authority Nikoley, writing on his blog, Free the Animal. There is something very compelling, almost addictive, about this food. While more research is still needed, people who took resistant starch supplements, including tiger nuts experienced suppression of appetite, improved digestion, better sleep, and other beneficial outcomes, according to comments posted and compiled on Nikoley’s blog. A few people experienced an increase in flatulence and headaches. Tiger nuts are also a good source of phosphorus, potassium, vitamins E and C, amino acids arginine, glutamic, and aspartic, and digestive enzymes catalase, lipase, and amylase. Research compiled and published in Comprehensive Reviews in Food Science and Food Safety have found that consuming tiger nuts can be helpful for preventing heart disease, reducing the risk of colon cancer, treating digestive disorders, and regulating blood glucose levels. It is also suitable for diabetics and celiacs. He came right out to introduce himself and promptly guided us to a second entrance. “I cleaned it for you,” he explained with a warm smile. His fiancee Kinkladze flashed us a knowing smile. She had witnessed everything. None of the co-packers in the area met Organic Gemini’s standards for quality. The cleanliness was not put on. Despite the facility being in a state of flux—with new equipment arriving daily that will automate, and speed up processes significantly for the team of about 20 employees—things are orderly. Papanastasatos showed us a bowl of oatmeal he was eating made with a tiger nut by-product from the new smoothie mixes. A recipe tester had just made it in their in-house test kitchen. He said this is just one of the new products they are exploring. They have ideas for flatbreads, crackers, and more. As long as its gluten-free, nut-free, dairy-free, allergen-free, and kosher, Organic Gemini will consider it—as long as it features tiger nuts. Papanastasatos said he enjoys having his own manufacturing facility to keep the R&D affordable. Besides, none of the co-packers in the area met Organic Gemini’s standards for quality. 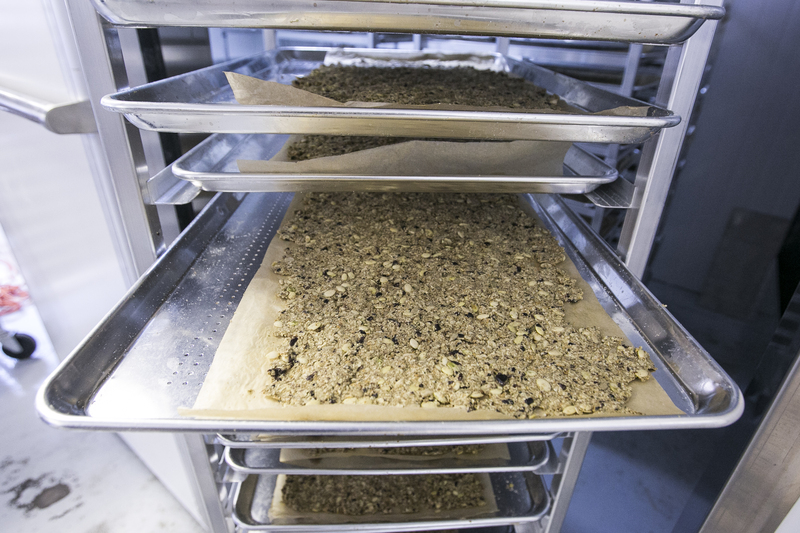 Subsequently, the company has invested heavily in the highest quality standards, obtaining certifications for organic, kosher, vegan, gluten-free, and non-GMO, and implementing high-end processing technologies. Organic Gemini uses a four-step water filtration system that reinvigorates the water used to make its TigerNut Horchata drinks. 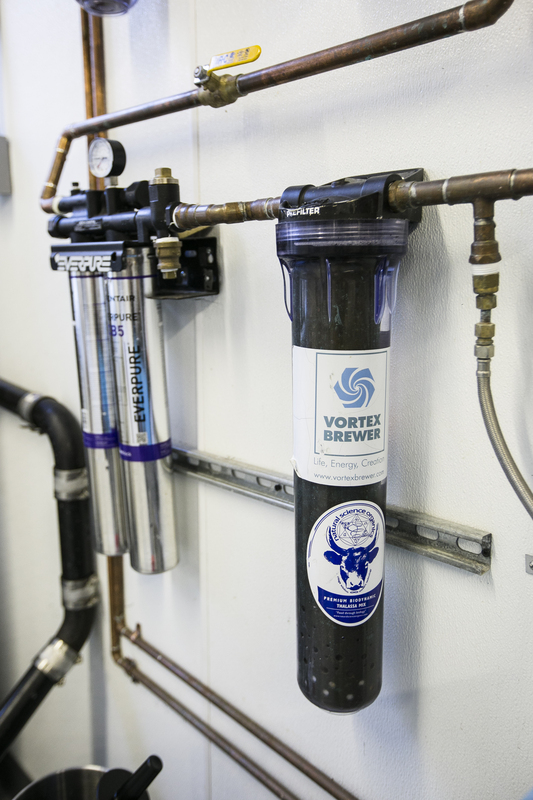 It works by first running regular water through a filter that structures it to a more natural state, followed by three pre-filters and two carbon filters to remove impurities, and finally a vortex brewer energizes the water via exposure to crystals and magnets. Once the horchata is made, the bottles are subjected to high pressure processing under 20,000 units of atmospheric pressure for three minutes—effectively simulating the environment at the bottom of the ocean—to preserve the shelf life without pasteurization. When tasting tiger nuts for the first time, their fibrous outer shell and shockingly sweet taste reminded me of stevia leaf (a natural sugar alternative), but the rich dimension of flavor and nutrition delivered far greater satisfaction. A love affair between tiger nuts and Organic Gemini’s founders was palpable when around them. After I got over the novelty of the amount of chewing this snack required, I could not help myself from reaching for more. There is something very compelling, almost addictive, about this food. My brief connection to tiger nuts is nothing compared to that of Kinkladze and Papanastasatos. A love affair between tiger nuts and these two was palpable when around them. Papanastasatos said he hardly feels the need to eat anything else. He is “running on tiger nuts.” Kinkladze takes swallows of TigerNut Horchata—strawberry and unsweetened—like her life depended on it. Organic Gemini’s story is founded on how Kinkladze managed to heal herself of a cancerous ovarian cyst through a nutritionist-managed diet and lifestyle changes, which included consuming tiger nuts. Papanastasatos, her boyfriend at the time, supported her by making the same dietary changes. The couple had discovered tiger nuts at the horchaterias in Spain in 2013, shortly before Kinkladze learned of the cancer. Today, the couple have a beautiful (and very chubby) baby boy of 21 months. 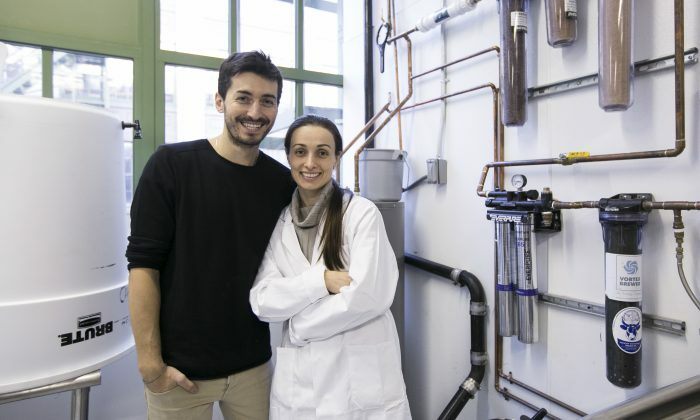 Papanastasatos, originally from Greece, had worked in sales and marketing for a number of natural drink companies before starting Organic Gemini. These included Guru organic energy drink, FitPro protein drinks, and a startup that didn’t survive. With a college background in accounting (good to know for an entrepreneur), he now had plenty of sales experience and industry knowledge. When he met Kinkladze she was fresh out of Columbia University’s political science department and looking to start a coconut water energy drink company, thinking if it were successful it could help to fund non-profit work she had been doing and cared about. We came into this to spread good energy and love. It is Mother Nature. She provides it, and we put it in the bag. Papanastasatos said he quickly realized coconut water was overdone and saw the opportunity in tiger nuts. They were both drawn to the idea of bringing something exceptionally pure to market. “We came into this to spread good energy and love. It is Mother Nature. She provides it, and we put it in the bag, and people can access it,” said Papanastasatos. They were very fortunate that Kinkladze’s father Harvey Weinstein, owner of Turtle Bird Stable, was able to invest $3 million to help the couple get their business started. It took Organic Gemini just one year to develop its products, package, and brand them, and obtain the first store account with Whole Foods. The product launched in April of 2014. As the brand grew and the number of stores carrying it grew, Organic Gemini also grew out of its original facility. By the time the team decided to move to their own digs, the company was sprawled out over eight leased spaces on four floors of the old Pfizer building. Organic Gemini is currently working on a new round of investment of $2 million from friends and family to fund further growth, which involves a new partnership with Dynamic Presence, one of the largest independently owned natural products brokers in the country. The partnership values Organic Gemini at $10 million six months from now. Sales are meeting internal sales projections, according to Papanastasatos. They are already up 40 percent each month for the last half-year. The fingertip-sized vegetable is characterized by parallel ridges that you could say resemble the stripes on a tiger’s coat. Maybe this is how the tiger nut got its name. Nobody really knows. America is still not ready for authentic Indian fast-casual, market research shows.